A parrot is a bird belonging to the biological family Psittacidae, which together with the Cacatuidae (cockatoos) belong to the biological order of the Psittaciformes. 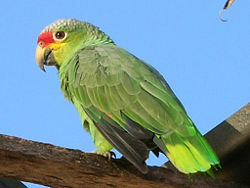 Depending on preference, the name parrot is either used for any species within the order Psittaciformes or more limited for the family Psittacidae. See for parrots the family Psittacidae and for cockatoos the family Cacatuidae.